Are Pet Owners Being Misled Regarding the Safety and Reliability of Microchip Implants? Microchips are being implanted in dogs and cats by veterinarians, animal shelters and breeders for identification purposes. Microchips are also being implanted by members of the public who have taken a brief microchipping course; either online or in person. Fish, ferrets, horses, alpacas, turtles, elephants, birds, llamas, laboratory animals, zoo animals, and even snakes are being chipped. But are microchips a reliable form of identification? And are there health risks associated with the implants? 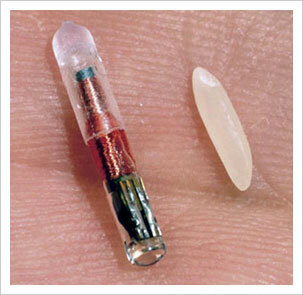 Microchip implant (with anti-migrational sheath) next to a grain of rice. Microchip implants are marketed as a safe and permanent form of identification that lasts the lifetime of the animal. They are also marketed as a way to reunite lost or stolen pets with their owners, to significantly reduce the number of pets in shelters, to identify and punish owners of dangerous dogs, and to prevent bad breeding practices and cruelty to animals. Reasons used to promote and sell implantable microchips may sound appealing. However, before being enticed by carefully crafted advertising that is being used not only to convince people to have their animals microchipped, but also to implement mandatory animal chipping legislation, it is important to examine the facts. "Subcutaneous Microchip-Associated Tumours in B6C3F1 Mice: A Retrospective Study to Attempt to Determine Their Histogenesis,"
Scotty after removal of tumour and microchip implant. However, ask yourself how negligible the microchip-cancer risk is if it’s your pet that develops cancer. Also ask yourself why decades of scientific data proves that an object implanted in the body can cause cancer, yet nay-sayers of the microchip-cancer risk claim that microchip implants cannot cause cancer. 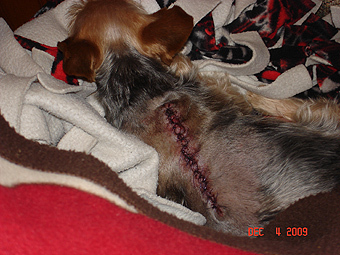 When presented with cases like Scotty’s, Bulkin’s, Charlie Brown’s and others, many people justify the health risks of chipping by saying that adverse reactions to microchips are “rare.” However, as veterinarians and animal shelters are not required to report adverse or suspected adverse microchip reactions, only an extremely small number of microchip reactions are accurately reported and recorded. Microchip implants are marketed as a permanent form of identification. However, they can stop working or be expelled from the animal’s body. 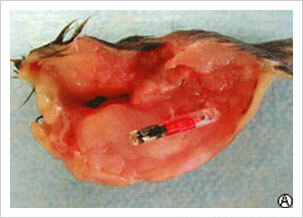 Microchips are also known to migrate (move from the original implant site) and become lost within the body. 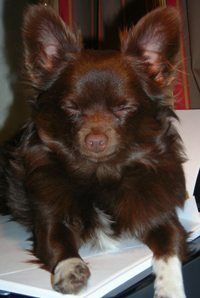 As a result, it is impossible to identify the animal via his or her microchip. Another well-known slogan used to sell microchips is, “Microchips help reunite lost and stolen pets with their owners.” But this catchy phrase is deceptive and provides a false sense of security for pet owners who believe that their pet’s chip can be read by all microchip scanners. Tragically, an 8-month-old American Pit Bull Terrier named Hadden was euthanized at the Stafford County, Virginia, Animal Shelter after the scanner that was used to read his chip could not detect the implant. Another important point that pet owners must be aware of pertains to recovering their stolen microchipped pet. Specifically, if your chipped pet is stolen, the chip does not guarantee that you will find your pet. Also, recent cases in the UK reveal that the chip does not provide proof of ownership. (24-25) So, even if you locate your stolen, microchipped pet, it is possible that your pet will not be returned to you. For example, in April 2010, Dave Moorhouse was contacted by Anibase, a microchip database company, asking if he wanted to change the ownership records of his Jack Russell Terrier, Rocky. 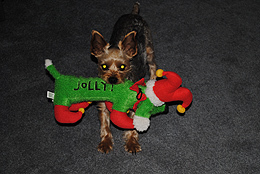 Mr. Moorhouse told Anibase that Rocky had been stolen and asked where he was. However, Anibase refused to provide information regarding Rocky’s whereabouts. 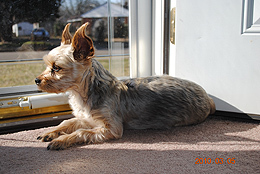 Although Rocky’s microchip was registered to Mr. Moorhouse, the police concluded there was no criminal case and refused to help him find Rocky. A Huddersfield County Court judge ruled that the situation was out of his jurisdiction. Implantable microchips are also promoted for use in “dangerous” dogs so that their owners can be identified and held responsible for their dog’s bad behaviour. However, owners of dangerous dogs will probably find a way to avoid having their dogs chipped. Also, owners of dangerous chipped dogs could have the chip removed, either surgically or by some inhumane method, in order to avoid being identified. Unfortunately, compulsory chipping will not prevent bad breeding practices, unhygienic conditions or cruelty to animals by bad breeders, those involved in puppy mills, or anyone else for that matter. Instead, it is likely that microchips and insertion devices will be purchased via the Internet to reduce costs, and the implant procedure will be done by insensitive, untrained individuals in stressful and unhygienic conditions. As a result, puppies will suffer and/or die due to infections, abscesses, bleeding, neurological damage and cancer caused by the implants. Meanwhile, the conditions in which the dogs and puppies live will remain the same. Real-life evidence shows that microchip implants are an unreliable and potentially dangerous form of identification. In spite of the risks, microchip companies and advocates of microchipping continue to mislead pet owners by saying that microchips are reliable and safe. In addition, mandatory animal microchipping legislation continues to be enacted around the world. It is important that pet owners educate themselves regarding problems associated with microchips, and share the information with other pet owners, veterinarians, animal shelters and those involved in microchipping policies. Pet owners should also become involved in the process of reporting adverse microchip reactions, otherwise adverse consequences of microchipping will continue to be grossly under-reported. Special thanks to Dogs Naturally Magazine for publishing a shorter version of this article in the January-February 2011 edition of their magazine. The article is entitled "Microchips - Are Pet Owners Being Misled?" Click here to read "Microchip Implants: Technological Solution or 21st Century Nightmare?"